If you fail to issue a written litigation hold instruction to your client — is it negligence, negligence per se, or gross negligence, or perhaps not negligence at all? If ESI spoilation occurs, how severe should be the penalties for your client? The trial courts in most jurisdictions still are divided on the answers to those questions. That’s why we have prepared a brief discussion of two cases that have the reasoning you should know about when you prepare your courtroom argument. On either side of the counsel table, whenever you are preparing to argue a motion for spoliation of electronically stored information (ESI), these two outstanding opinions will give you a quick education on possible lines of attack or defense, plus leads to authorities you can cite. Pension Committee of University of Montreal v. Banc of America, 685 F. Supp. 2d 456, 2010 U.S. Dist. LEXIS 4546 ((S.D.N.Y. 2010)(Amended order). Rimkus Consulting Group, Inc. v. Cammarata, 07-CV-00405, 688 F. Supp. 2d 598 (S.D. Texas, 2010). The Pension Committee and the Rimkus Consulting opinions reach different results, but the opinions are by two of the most respected authorities in the area of e-discovery. The Pension Committee opinion was written by Judge Shira Scheindlin (Southern District New York), the author of what are probably the nationally most cited trial court decisions in e-discovery. Among other decisions, Judge Scheindlin wrote the multiple Zubulake decisions and Anderson v. Sotheby Inc. Service Plan.1 On 13 July 2012, she issued yet another landmark opinion, National Day Laborer2, which focused on the reasonableness of specifying keyword searches to produce relevant documents. Her expertise in providing trial judge level solutions to e-discovery disputes is so well known that trial judges in all jurisdictions feel that they cannot be criticized for following her opinions. In Pension Committee, loaded with footnotes, Judge Scheindlin states a bright line test and a harsh penalty for a lawyer who does not pass the test. Judge Scheindlin equates failure by an attorney to follow well-established standards of protection of electronically stored information with gross negligence. to preserve backup tapes when they are the sole source of relevant information or when they relate to key players and that information is not otherwise readily accessible. This definition of gross negligence does not depend upon the state of mind or the intention of the attorney. Any reasonably prudent lawyer in this century knows that he/she has to preserve relevant ESI and that his/her duty includes giving the client a written litigation-hold instruction when litigation is imminent. Therefore, ipso facto, failure to give a written litigation-hold instruction falls below the care of a reasonable lawyer. An attorney’s failure to issue a written litigation hold instruction to the client is negligent even if it results from a pure heart and an empty head. The next question for the trial court is to fashion a remedy for the negligence of the offending attorney. Judge Scheindlin and many other trial judges have the value-judgment that the remedial sanctions may have to be severe to provide real help to the offended party. The driving force behind Scheindlin’s remedy, and that of other trial judges in the same situation is the felt equitable need to provide an effective remedy to the destruction of ESI when the contents of the ESI are unknown. It is almost impossible for the requesting party to show the normal requirements for judicial sanctions for mere negligent destruction of evidence, to wit: that (1) the destroyed evidence was relevant and (2) the content of the destroyed evidence was material and would have been significant at trial. The only alternative to proving those two prerequisite points is instead to obtain the trial court’s ruling that the destroying party was either grossly negligent or intentionally destroyed the evidence. Hence, to relieve the offended party from the impossible task of proving what was in the ESI, Scheindlin decides upon a simple remedy: the court will declare the attorney’s failure to give a written litigation hold instruction to the client to be gross negligence. 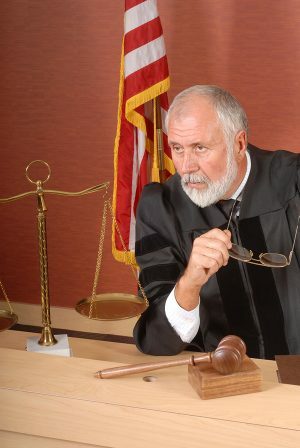 The remedy for “gross negligence” can then be a sanction of jury instructions which tells the jury that “gross negligence” in preservation of evidence has occurred, and the jury can presume the destroyed evidence was unfavorable to the destroyer.5 This puts the shoe on the other foot, and gives the destroyer of evidence the impossible task of proving the contents of what was in all the destroyed evidence. Scheindlin’s reasoning and procedure to remedy the destruction of evidence of unknown content will appeal to many trial judges. That is why you should know about her argument and decision, and be able to use it, or defend against it, when the need arises. If, for example, you are defending against a spoliation motion, you need to preempt the argument by citing your jurisdiction’s statute and case law defining and limiting what actions the court can declare as “gross” negligence. You can also use the authority of the Chin case (discussed below) to lead to a discussion of other actions taken by yourself that sufficed without a written litigation hold instruction to the client. If you are requesting spoliation sanctions, you cannot cite Pension Committee as untarnished authority. In a different case, Chin v. Port Authority6 (two years after Pension Committee) the Second Circuit rejected using a bright line rule regarding issuance of a written litigation hold instruction to the client. Chin adopted a “totality of the circumstances” test to determine whether failure to issue a written litigation hold to the client is, per se, gross negligence. For the Second Circuit, a written litigation hold notice may be reasonable in most cases, but it is not an absolute bright line rule for all cases. Chin states that other preservation actions by the attorney may make his/her failure to issue a written litigation notice not grossly negligent, perhaps not even negligent. The Rimkus Consulting opinion was written by Judge Lee Rosenthal (Southern District Texas). She was the Chair of the Federal Rules Advisory Committee’s Committee on Rules of Practice and Procedure, when the e-discovery rules amendments were developed and enacted in 2006, and still is the Chair. Because she is the Chair of the Federal Rules committee, trial judges in all jurisdictions feel safe following what she says should be done under the federal rules of civil procedure, or like state rules. Contrary to Judge Scheindlin, Judge Rosenthal holds that — unless a jury specifically finds both actual prejudice and also actual bad faith — a trial judge should neither declare “gross negligence,” nor order severe sanctions for ESI destruction. Her conclusion is that, instead, the appropriate sanction is to allow the jury to hear evidence of the defendants’ conduct-including deleting emails and attachments and providing inaccurate or inconsistent testimony about them-and to give the jury an adverse inference instruction. Specifically, the instruction should tell the jury that if it finds that the defendants intentionally deleted evidence to prevent its use in anticipated or pending litigation, the jury may infer that the lost evidence would have been unfavorable to the defendants. In addition, the offended party should be awarded attorney fees and costs in identifying and litigating the consequences. Judge Rosenthal takes this position in Rimkus Consulting, a much milder position than Judge Scheindlin in Pension Committee, though the Rimkus Consulting defendants willfully and deliberately deleted ESI. No doubt about it – with evil intent the Rimkus defendants deliberately destroyed ESI that would have been evidence against them. Their misdeeds were much worse than the “pure heart” attorneys in the Pension Committee case. Because of the reasoning and authorities contained in Rimkus Consulting, you should read it before making any spoliation motion argument. It contains is a different viewpoint than found in Pension Committee, and it contains load of citations to differing conclusions in the various federal circuits. It will either arm you with material you can use, or warn you about what the other side will be arguing to the trial court. There are a variety of trial judge opinions regarding when a litigation hold instruction must be given to the client, and what are the consequences if without a litigation hold instruction from the attorney the client destroys ESI that may contain relevant evidence. If you are involved with a motion for sanctions because of destruction of ESI, the Rimkus Consulting and Pension Committee cases are good places to find reasoning and leads to authority. Not only is a written litigation hold a reasonable step to prevent your client’s deletion of relevant information, but also it documents your own good faith attempt as an attorney to preserve ESI. Judicial and scholarly opinion seems agreed that it is a “best practice” to issue a written litigation hold in all cases. None of the cases discussed in this article suggest that attorneys should back away from a best practice of issuing, in all cases, an appropriate written litigation hold instruction protecting the client’s ESI from destruction. Read more about ESI litigation hold letters and forms to speed your work, in preparing letters to your client or to the adverse party. 1 2005 U.S. Dist. LEXIS 23517 (S.D.N.Y. Oct. 11, 2005). 2 National Day Laborer Organizing Network et al. v. United States Immigration and Customs Enforcement Agency, et al. 2012 U.S. Dist. Lexis 97863 (SDNY, July 13, 2012). 3 Pension Committee of University of Montreal v. Banc of America, 685 F. Supp. 2d 456, at 465 (S.D.N.Y. 2010). 4 The attorney failed to institute a litigation hold instruction to preserve electronic backup tapes after litigation was “reasonably clear,” although this was ten months before a lawsuit was filed. “I instruct you, as a matter of law, that each of these plaintiffs failed to preserve evidence after its duty to preserve arose. This failure resulted from their gross negligence in performing their discovery obligations. As a result, you may presume, if you so choose, that such lost evidence was relevant, and that it would have been favorable to the Citco Defendants.